In the hospital, flat-lining is not a good thing. In loudspeakers, flat-lining is the best thing. A flat frequency response means that all the performance-robbing resonances, deficiencies, and colorations have been ironed out of the speaker's performance. All that remains is the lifelike sound. Audiophiles universally agree: Flat response (in the important midrange especially) directly correlates to accurate audio reproduction. This is the Holy Grail of loudspeaker performance. Paradigm achieves it. How? By conducting the most accurate frequency response measurements possible in the hemisphere's largest privately-owned anechoic chamber. Our astonishing 36,000-cubic-foot (more than 1 million litres), fully-isolated anechoic chamber, and its proprietary testing and measurement system, is light years beyond the industry standards for accuracy. It leaves the usual low-cost, misleading, computerized pseudo-anechoic techniques in the dust. By testing our loudspeaker performance in a completely isolated environment, where calculations can be done with extreme precision, we can immediately pinpoint deficiencies and variables. In the chamber, our proprietary Automated Servo Mechanism allows laser-calibrated measurements between the microphone diaphragm and loudspeaker azimuth accurate to within ± 1/10th of a degree. Additional measurement capabilities include: Total Sound Power, MLS, Swept Sine, Stepped Sine, FFT, Impulse Response, Wide-band Spectrum Analysis, Impedance, Phase Response, Total Harmonic Distortion, Individual Harmonic Distortion Analysis (2nd, 3rd, 4th, 5th, etc. ), and Mechanical/Vibrational Analysis. In fact, Paradigm's cutting-edge, anechoic-based measurement and testing system allows for consistently accurate high-resolution measurements through the complete audible range, right down to an unheard of 6 Hz! All of these measurements are computer-based, using exact digitally generated signals. A proprietary user interface maintains our extensive measurement database, and allows for immediate comparative analysis for any outcome. The end result of all this attention to detail and testing and measuring (and re-testing and re-measuring), is actually nothing. No resonances, no coloration, no vibrations and no turbulence: a flat-lined frequency response that reveals the most accurate, most realistic audio imaginable. 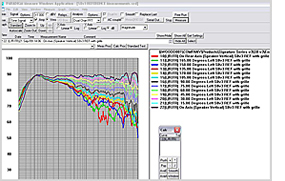 Screen shot of our advanced digital data acquisition and measurement system, software developed and perfected by Paradigm researchers.